Description: Red Fence™ Photinia is a compact, strong growing Photinia with crinkled, ornamental leaves. Its red new growth is accompanied by its suitability as a hedge or screen. 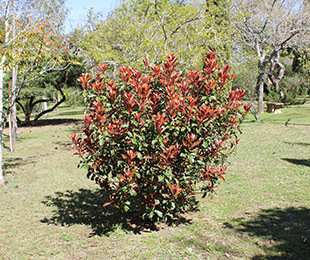 Red Fence™ Photinia has small white flowers in mid to late spring. It only needs yearly pruning, which is half that of regular Photinia. Although pruning twice a year will result in a tighter hedge. Size: 1.5m high x 1m wide after 5 years, reaches 2m high in good soil types. Uses: As a fence, short screen or hedge. Care: Water as required for 8-13 weeks until established. Plant in a well mulched garden (chunky mulch is recommended). Fertilise yearly with slow release fertiliser. Prune yearly, or twice per year for a tight hedge. Where it works: South QLD, NSW, ACT, TAS, SA & WA.